photo: Malik Sanchez led BC with 17 points, seven rebounds and three steals last night at Whatcom. photo by Rick May. 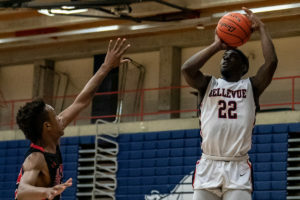 In another close battle in the NWAC North Region, Bellevue College men’s basketball fell to Whatcom last night 93-85. The Bulldogs built a 42-36 lead at halftime as Emmanuel Siale was on fire, draining all four of his attempts from three-point territory leading the ‘dogs with 12 points heading into the locker room. In the second half, Siale could not keep his magic touch as Whatcom as a team caught fire, shooting an electric 61% from the floor. The Orcas dominated inside, outrebounding BC 27-13 to take control of the lead and the game. With the Bulldogs up by eight with 13:38 to go, Whatcom gained momentum reeling off six straight points. A three-pointer by Whatcom’s Tevin Bane with 7:03 to go tied the game at 64. After Whatcom would stretch out a lead to eight, Malik Sanchez gave BC hope with a three-pointer and free throw with :19 left down by six, 91-85. In a must foul situation, Whatcom’s Grant Balvanz put the game out of reach sinking both of his attempts at the line with :17 seconds to go. Sanchez and Siale led the Bulldogs with 17 points apiece. Sanchez also led the team with seven rebounds and three steals as well. Bellevue is now 1-1 (10-5 overall) and hosts Shoreline, this Saturday January 19 at 6:00 p.m.